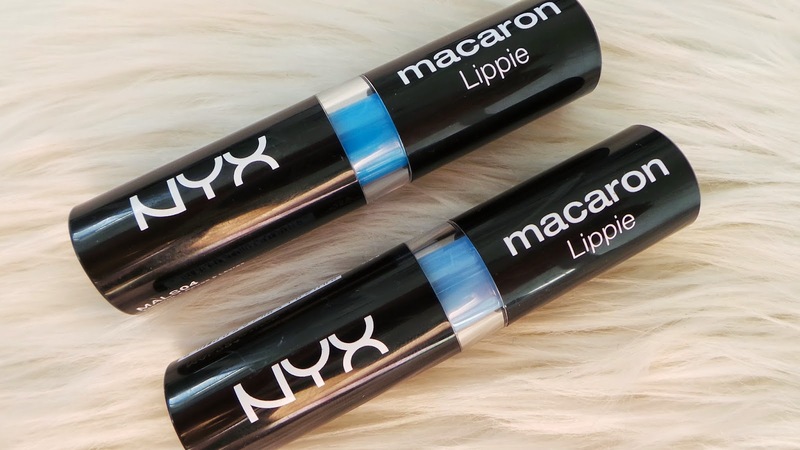 Today I am showing you some swatches of the NYX Macaron Lipsticks. 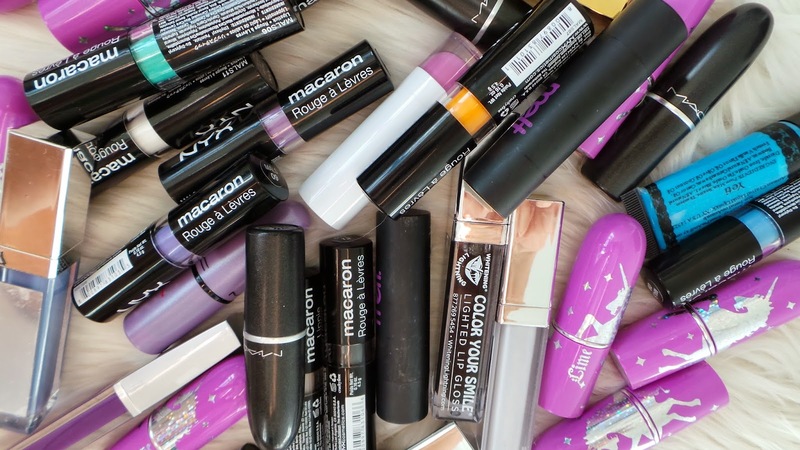 I am in LOVE with many of these shades! You would have heard me talk very highly of the purple one already. Keep an eye out on my YouTube channel to see my Review and Swatch video for these coming soon! There are 12 shades in total. 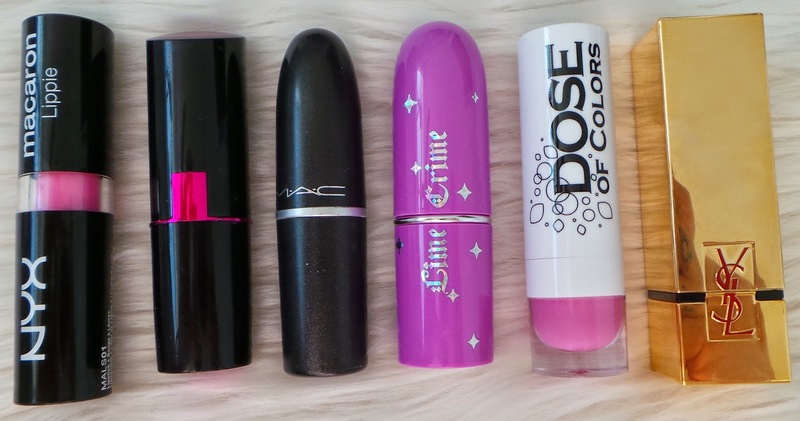 Today I'm just putting in some lip swatches of each colour, plus some other lipsticks for comparison. Please note these aren't necessarily 'dupes', just similar colors for your reference. I hope this helps! 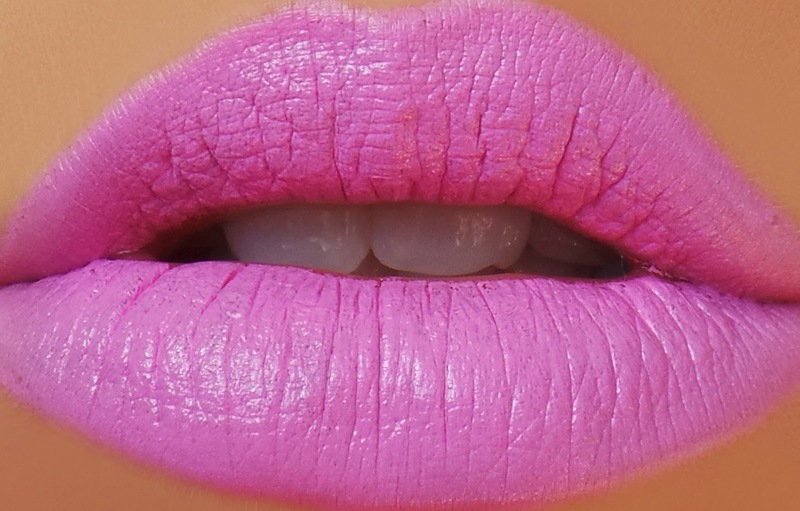 This shade comes off a bit brighter and lighter on the lips than it looks in the bullet. I love this shade! Its slightly lighter than my other favourite bright pinks - Great Pink Planet and Saint Germain. 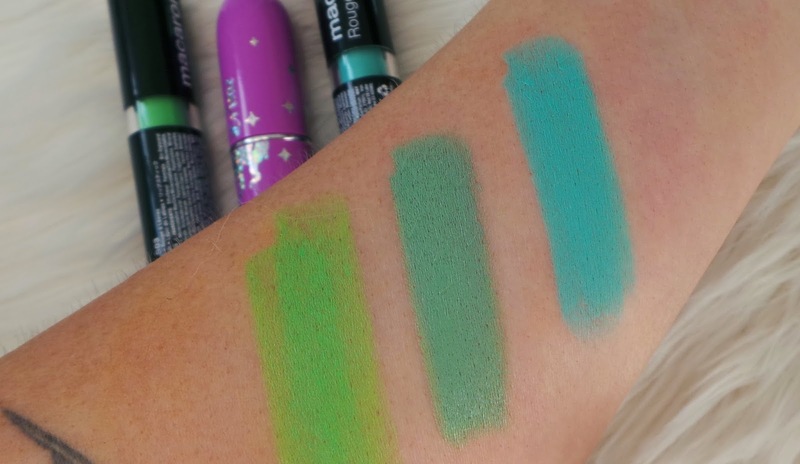 This shade is super neon and out-there, but easy enough to wear paired with a full coverage base and neutral eyes. I think this is one of the more 'wearable' shades of the bunch, considering they are all quite unusual! 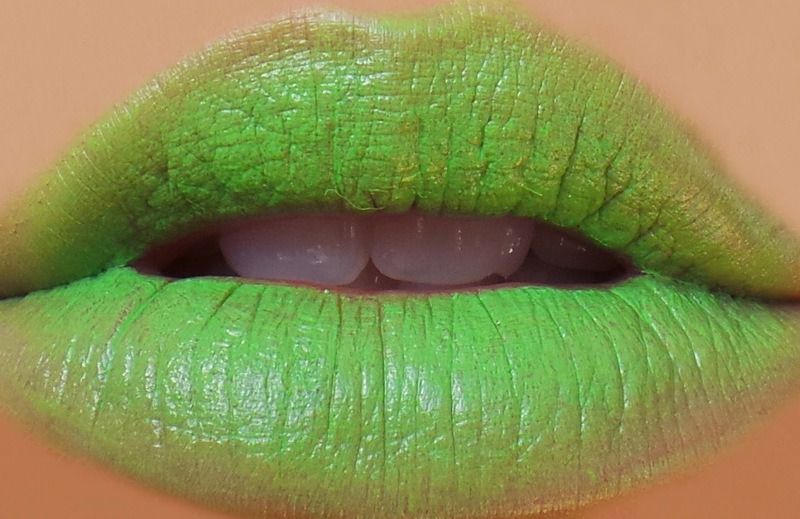 As you can see, NYX's yellow is far darker than Limecrimes one! 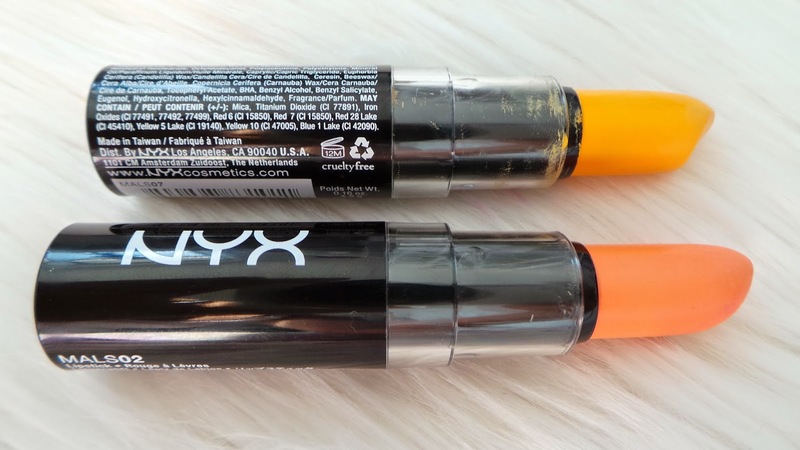 I prefer the NYX - as, as far as a yellow goes, its more wearable. 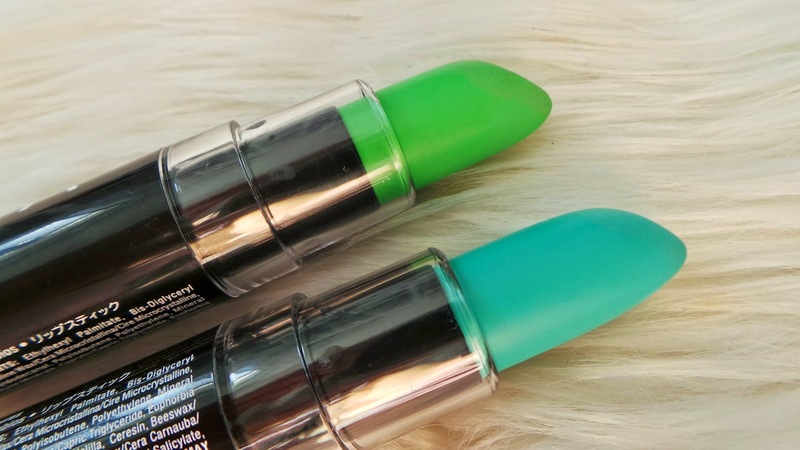 It also doesn't sit as chalky on your lips as Limecrime New Yolk City. 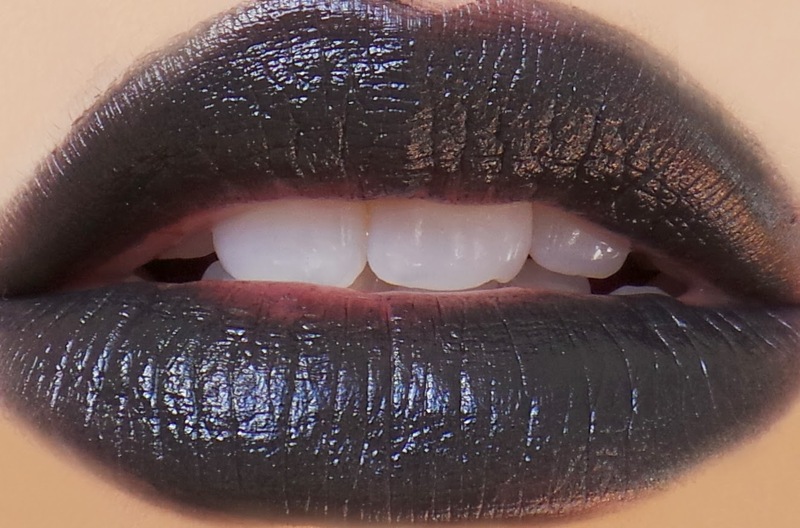 I have a tutorial coming with this lipstick soon! NYX Macaron in Orange Blossom is another of my favourite shades of the bunch. 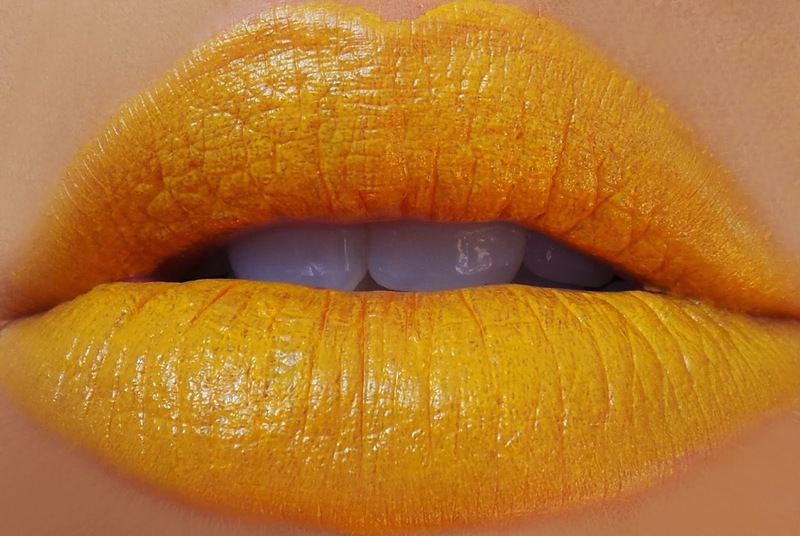 Its easy to wear, and I find it looks quite similar on the lips as Limecrime Cosmopop, despite LC being quite a bit darker and more orange based rather than yellow. 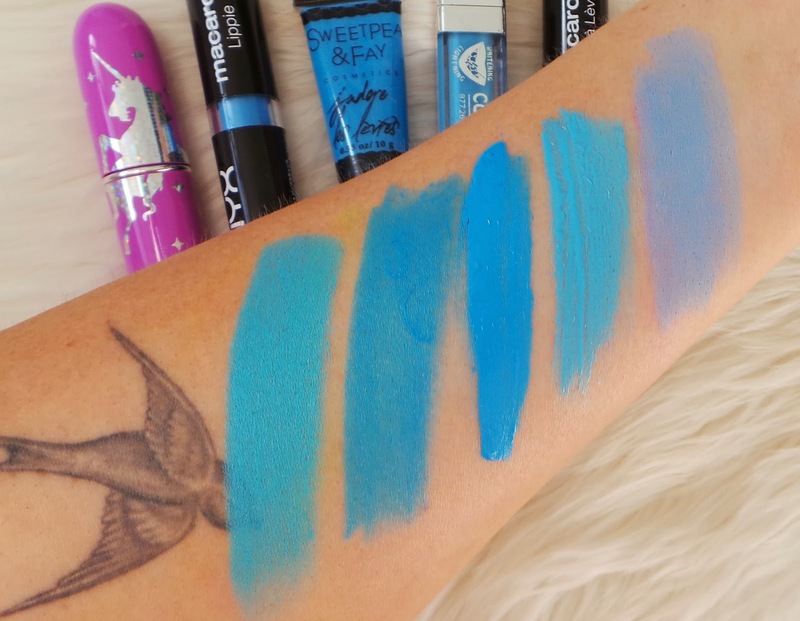 This shade is super pretty, and different enough to the LC one to justify both! 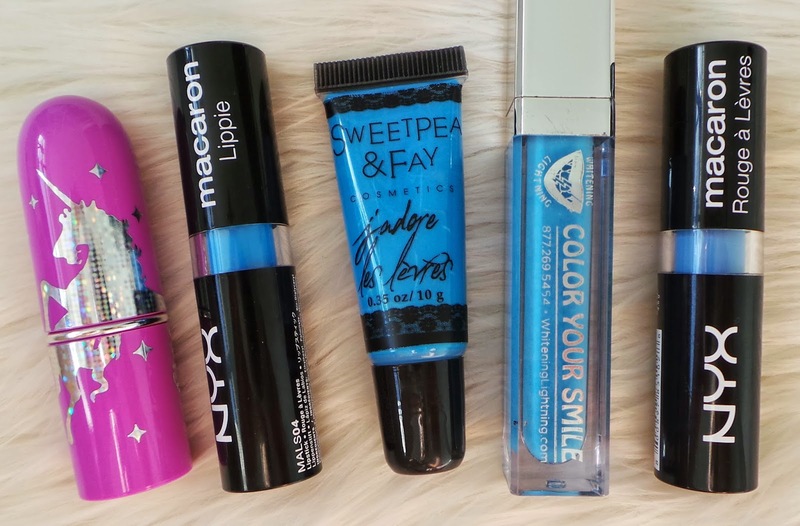 But, if you can only afford one, go for NYX. Its a great colour! Very similar to MAC Tangerine Dream, but a different finish. MAC is glossier, NYX is creamier. Next up, top is Blue Velvet, bottom is Earl Grey. 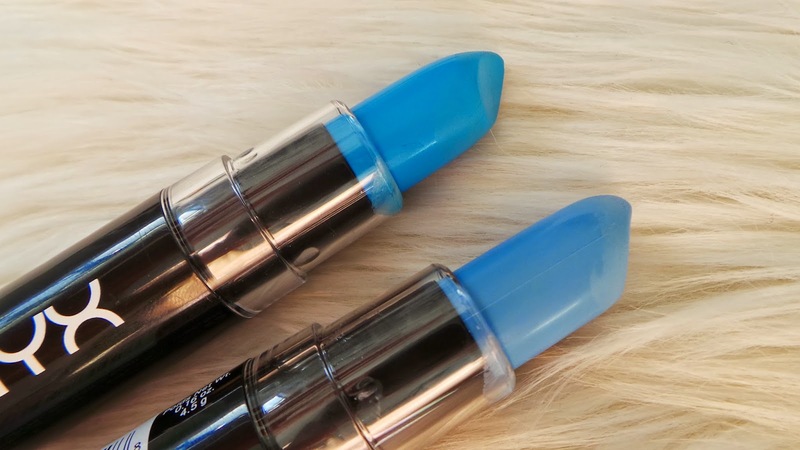 These blue lipsticks are awesome! I wish they made a dark blue or navy also, but I saw on their Facebook page that they are formulating a range of dark gem inspired coloured lipsticks - yay! 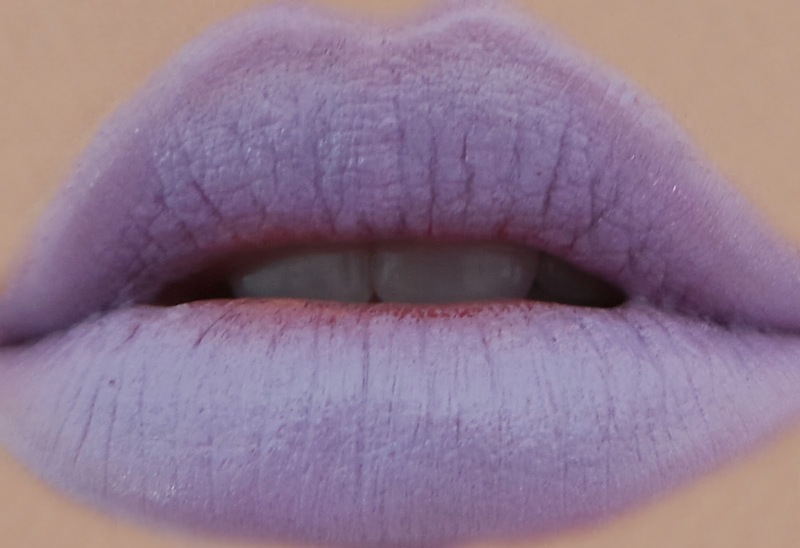 The NYX Macaron lipstick in Earl Grey is gorgeous, its almost like a lilac based light blue. Love! So unique. Next here we have my FAVORITE purple lipstick on the top, NYX Violet, and the bottom is NYX Lavender. Violet is the BEST purple I own. I am obsessed. Its deeper, so its easier to pull off. Its so pigmented… so creamy… so amazing! Lavender is similar to D'Lilac but better. I think its more wearable as it isn't as bright! Love! Next up, Black Sesame, Chambord and Coconut. These three are my least favourite provably, just because they are so 'meh'. BUT, if you are looking for cheap greys, blacks or whites, go for it! 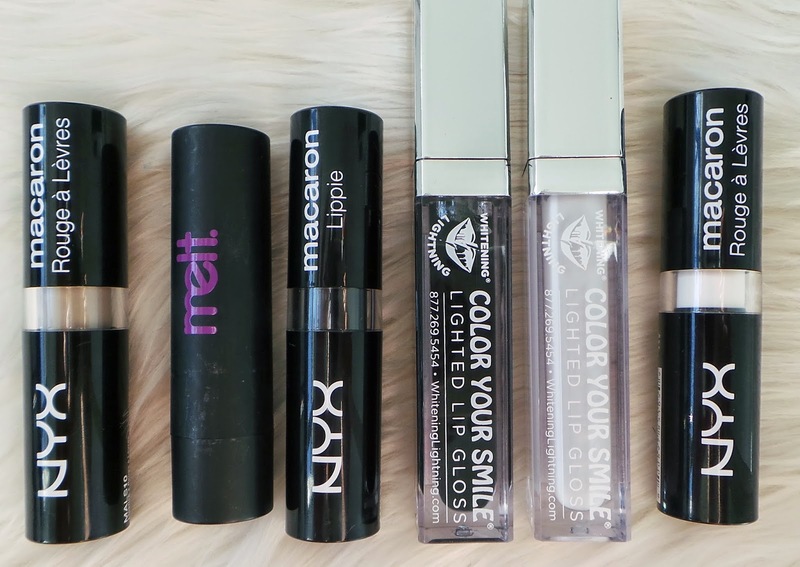 I prefer the glosses though, from Whitening Lightning. 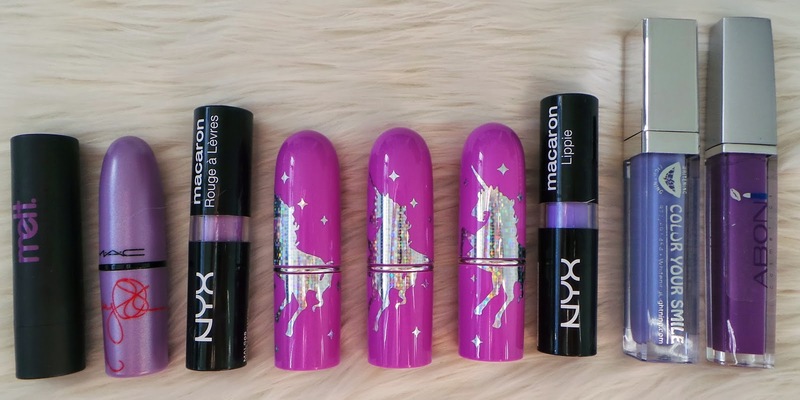 They are super pigmented and look nice, I would reach for them over the NYX. The light grey is quite unique though, I have to say! I hope you guys enjoyed this blog post! I will have the video up for you guys soon, so if you have any more questions, I probably answer them in the video! omg this post was so helpful shannon! 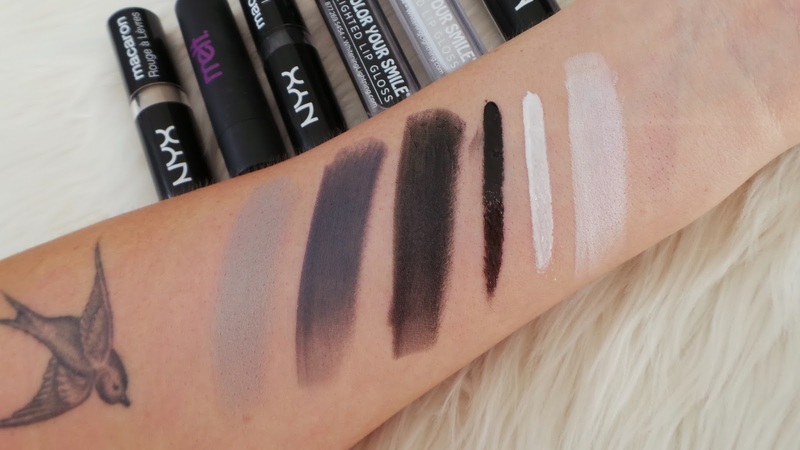 love how you showed the nyx colours next to other brands, such a good idea. 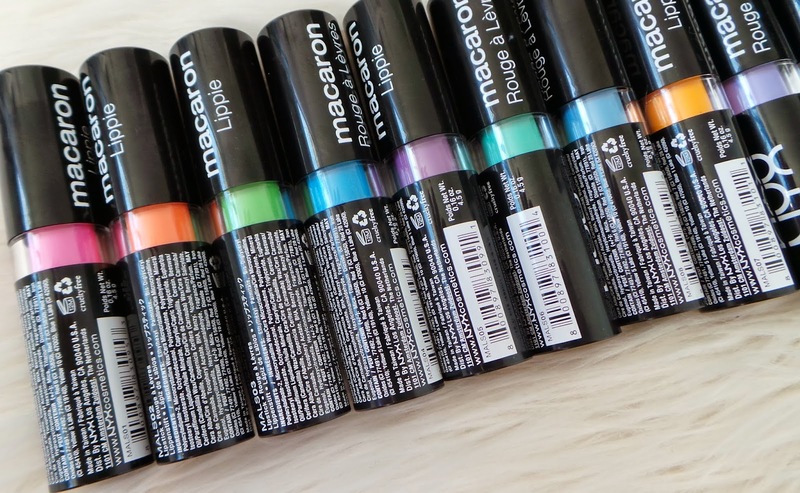 Need to get myself some of these macaron colours!! 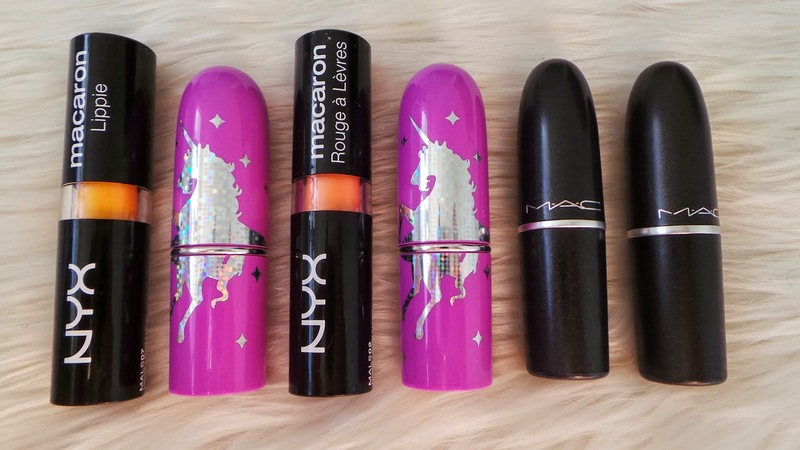 I love how NYX don't test on animals either, makes me love the brand even more! 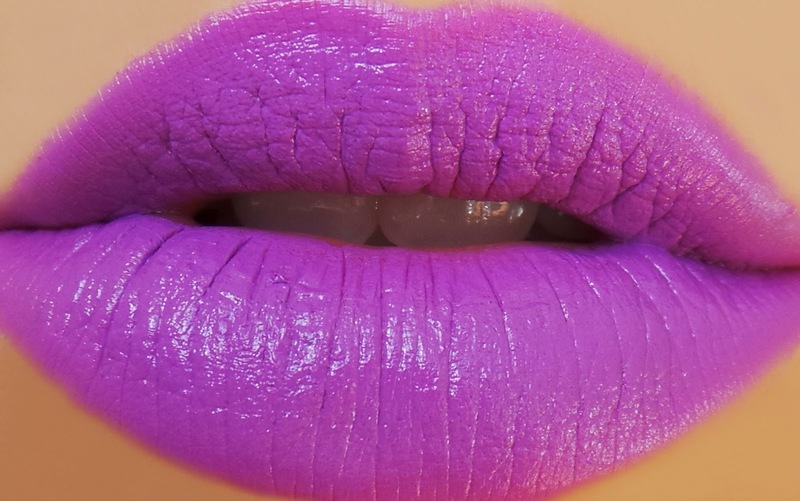 Wow Blue Velvet and Violet are both amazing, would love to see tutorials! I hope Cherry Culture restock soon! 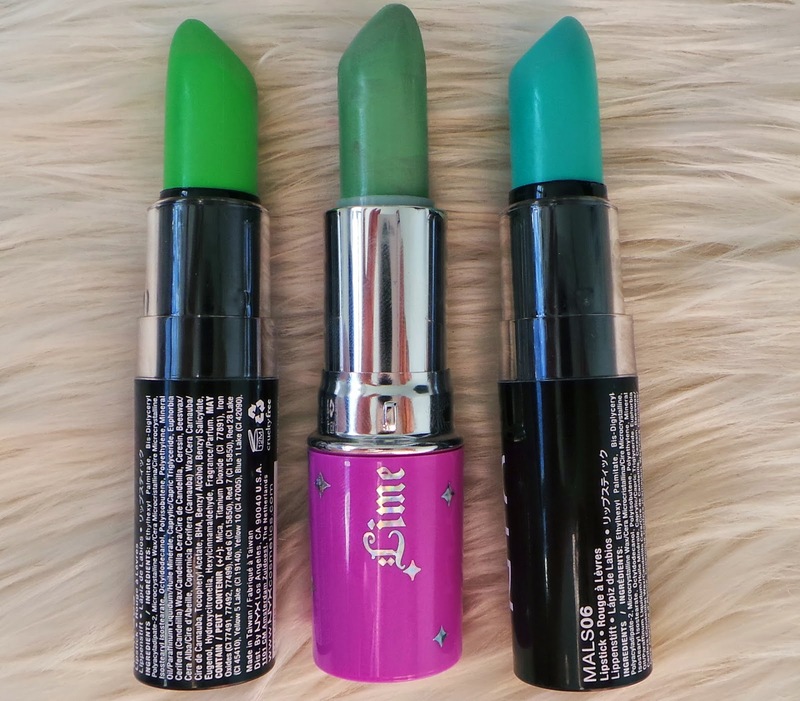 Absolutely love Blue Velvet, Pistachio and Violet<3 they are geourgeous! 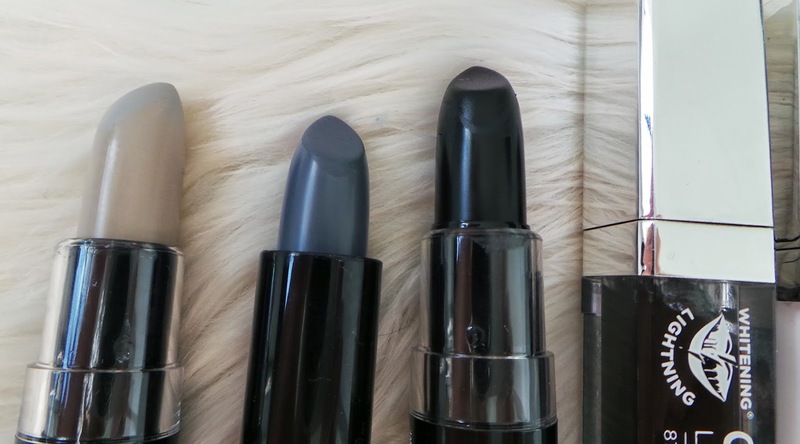 The lipsticks look absolutely amazing! 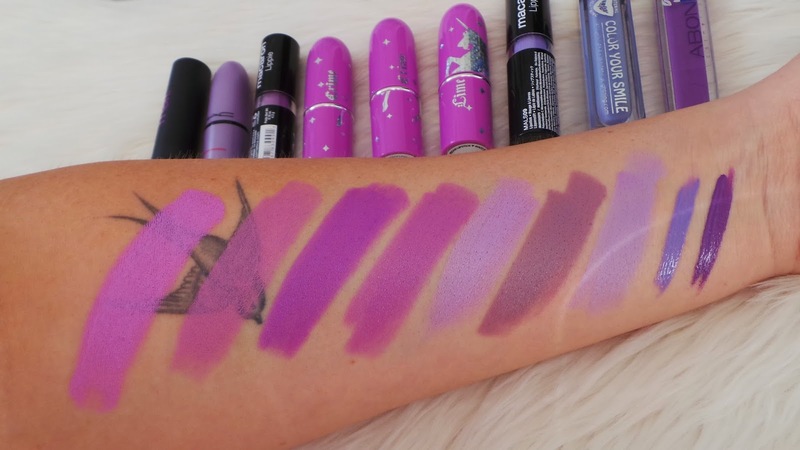 Don't know if I could pull of some of them though:) I will definitely have to pick up one of the violet shades, love the swatch! This blog post looks like it took a lot of time and effort so thank you for the thought! Lots of love from the US! You have actually inspired me to start my own blog recently…. and i dream to one day be as successful as you are! If you would check it out, I would be so overjoyed if you read or comment on my posts! These are all such gorgeous colours and you pull them off so well. Oh my gosh, I love all of these colors!! Hey Shannon! 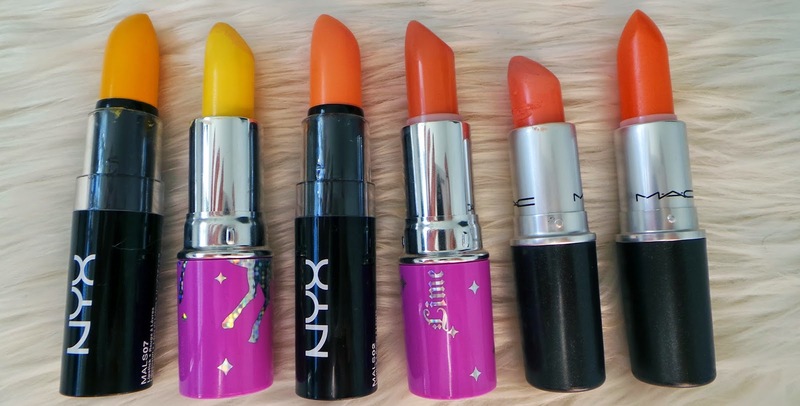 Do you know where else we can purchase these lipsticks (for NZrs)? Because Cherryculture is all out of them! Omg Pistachio and Blue Velvet are amazing! Been wanting to try Limecrime but never got to.. 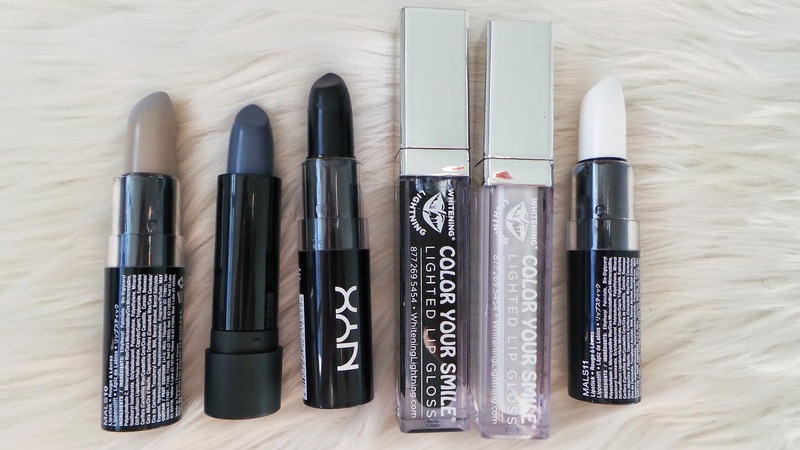 I think I'm going to give NYX a go first! You're amazing! Thanks! 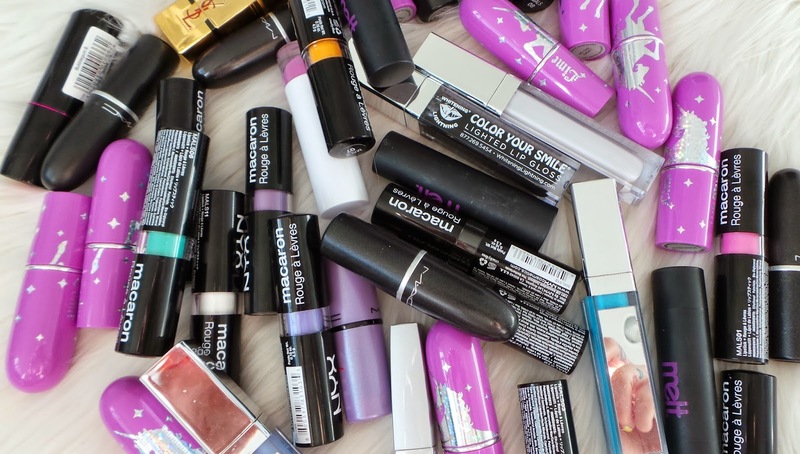 So many swatches! So much temptation! 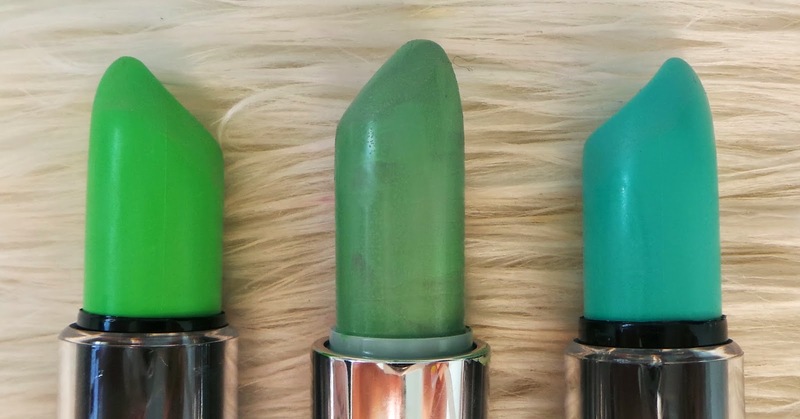 I'm not much for any lip product besides a little lip chap or lip gloss but, I am dying over the Pistachio colour. Hey Shannon!! 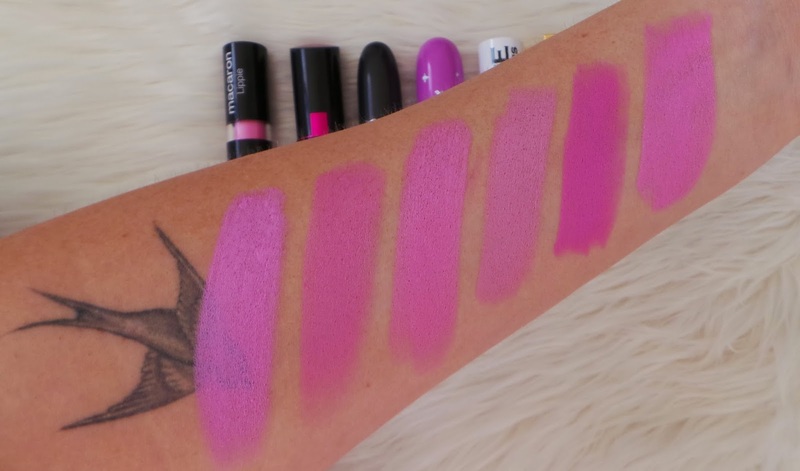 I just found out about a company called 'Coloured Raine' and they have tons of lipsticks in all kinds of colours as well! They have a ton of blues, a yellow, pinks, like basically everything. 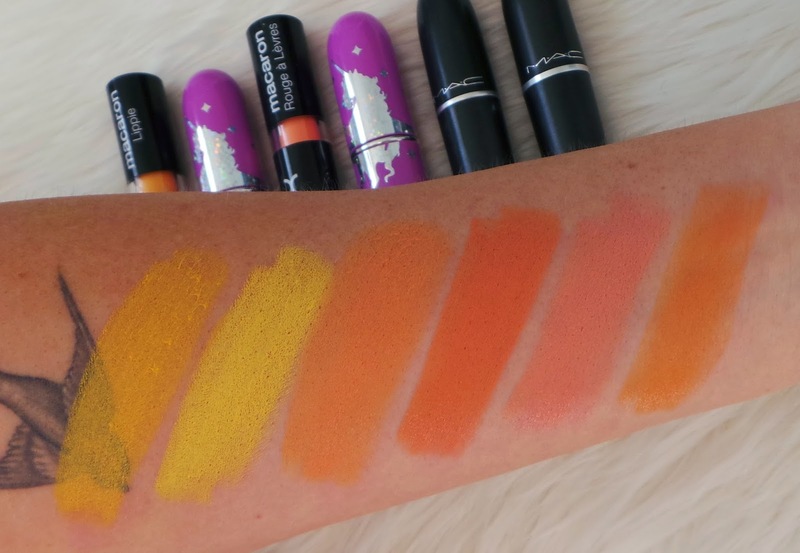 I haven't seen any reviews or swatches of them and thought you might be interested in seeing them!! ❤ all of these colors! getting ready to order a few of them. 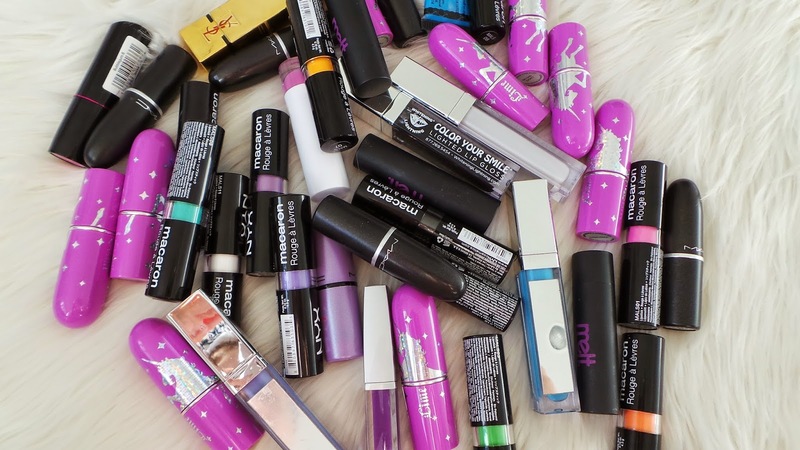 Very pretty lipsticks an nice collection you have. I'm trying to build my collection up. Oh by the way I subscribed to your YouTube channel as well. 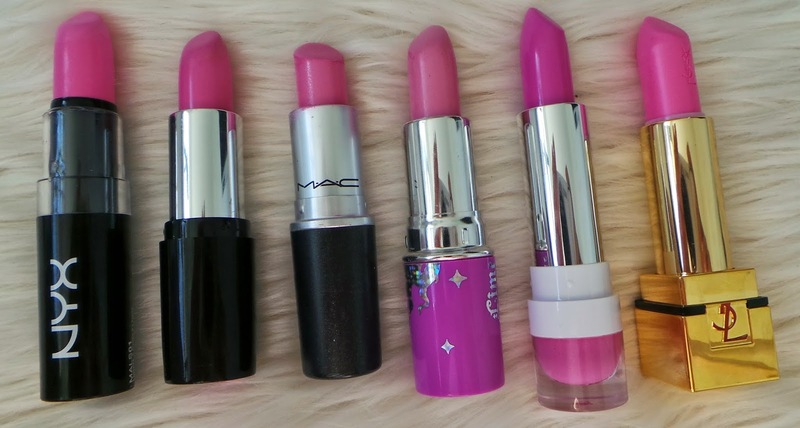 ☺ I really like how you put all these lipsticks together. Lots of options wide variety to see and choose from right here on this page!